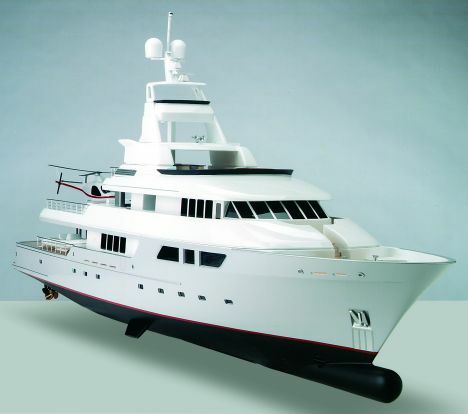 The United States boatyard Delta Marine is busy constructing a 163' motor-yacht characterised by the innovative solutions requested by its owner, a lover of deep sea diving. Consequently the new project includes the installation of a sophisticated sonar system and an unprecedented seabed mapping system created by Simrad, which uses photos to reproduce images on 3d cartography, so as to store data and reference points for diving trips. This 163 footer, which very probably will be completed by summer 2004, develops over three decks plus a flying bridge, characterised by comfortable interiors, latest generation technology and spaces designed to ensure complete, safe mobility even by disabled guests. The boat's exclusivity is due not only to its sophisticated electronic systems but also to the up-and-over inner spaces and to the stabilising system that activates when at anchor or at a complete standstill. The layout of the interiors has the guest cabins and crew quarters on the lower deck where there is also a fitness room and a large refrigerated pantry, while the owner has a private area in the "wide open" section on the main deck, equipped with en suite bathroom, small library, sitting room and office. The latter also includes a small workstation for editing the videos filmed by the many cameras placed around the yacht; one is even installed on the bows bulb. On the main deck to stern there is a saloon for relaxation and dining. While outside the cockpit can be used to house two 24' tenders, easy to manoeuvre thanks to a suitably powerful davit. The upper deck is characterised by a large landing platform aft for a helicopter as well as its modern command bridge. From this deck it is possible to also access the bows where we find the berthing equipment. The flying bridge is equipped with a Jacuzzi tub and leisure area for the owner and his guests, above which there is a small area for detection fishing. Still following the philosophy of making life onboard easier for the disabled a handy lift connects all the decks. For further information: Delta Marine Industries; 1608 South 96th Street; Seattle; Washington 98108 USA; tel. 206 763 2383; fax 206 762 2627; website www.deltamarine.com.